Farm fresh. EB quality approved. Vegetarian fed hens. Now! Stays fresher longer (based on independent market survey. Visit www.egglandsbest.com for additional information). Eggland's Best Cage Free eggs just got Even Better! Farm Fresh Eggland's Best Cage Free eggs have always been recognized for their exceptional taste. Every hen selected to lay Eggland's Best Cage Free eggs is free to roam in a pleasant, natural environment and is fed Eggland's Best all-vegetarian diet. Now, in addition to their great taste, they are an excellent source of Vitamin D, Vitamin 812, Vitamin E, Vitamin B2 (Riboflavin) and Vitamin B5 (Pantothenic Acid) and also a good source of Folate. Plus, our eggs contain 125mg of Omega 3 fatty acids and 200mcg of Lutein and have 25% less saturated fat than regular eggs. 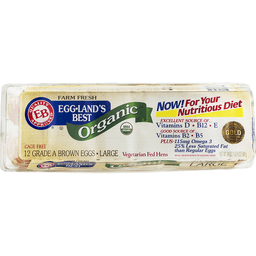 How does Eggland's Best produce such nutritious and great-tasting eggs? We feed our hens an improved wholesome all-vegetarian diet with no animal fats or animal by-products. Laying hens' diets contain no added hormones. Antibiotics are not used in the production of Eggland's Best eggs. The results: our all-vegetarian diet produces important nutrients and the best taste possible, so you can eat even healthier while enjoying the same great right-from-the-farm freshness and taste of Eggland's Best eggs! We think you'll agree that the extra effort and care we put into producing these special eggs are worth it. Recommended American Diabetes Association/American Dietetic Association dietary exchange: 1 Eggland's Best egg for 1 medium-fat meat. USDA organic. Certified Organic by Quality Assurance International. Excellent Source of: Vitamins D. B12. E. B2. B5. Plus - 125 mg Omega 3. 25% less saturated fat than regular eggs. Per egg - see nutrition facts for cholesterol content. Saturated Fat 25% less than ordinary eggs: 1 g vs. 1.5 g (quantities rounded). If you are concerned about cholesterol, follow a diet lower in saturated fat and cholesterol and ask your doctor or dietitian about Eggland's Best Clinical studies. BrandSpark: Most trusted by shoppers. We share your concern about the environment. We use recycled plastic packaging. Please recycle. Questions or comments, call 800-922-3447 or visit www.egglandsbest.com. For kosher questions: see www.oukosher.org. Voted Most Trusted Egg Brand by American shoppers. Based on the 2017 BrandSpark/Better Homes and Gardens American Shopper Study.